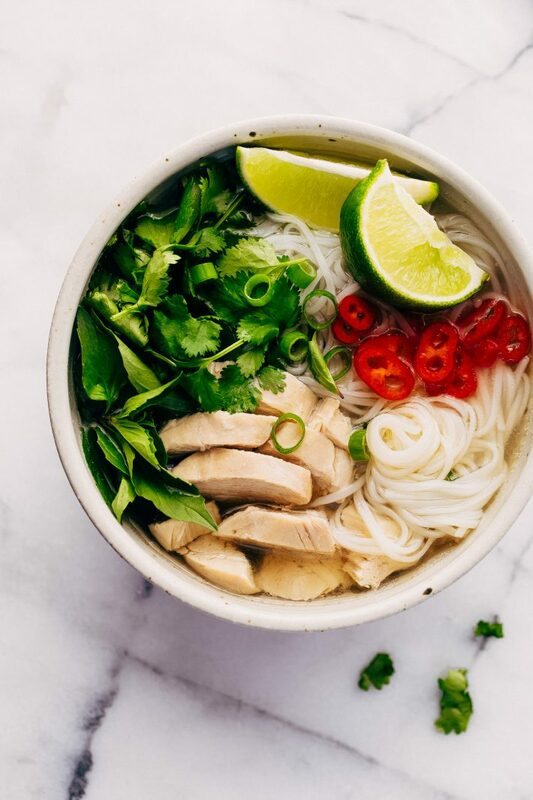 Instant Pot Chicken Pho is the perfect thing to make when it’s freezing outside, and you want something warm and comforting. 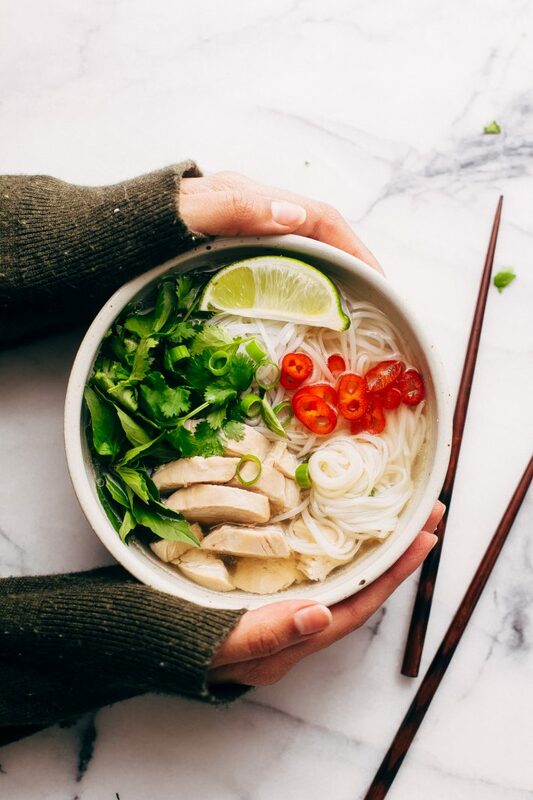 We start entirely from scratch, and in just over an hour you have homemade chicken pho ready to go! 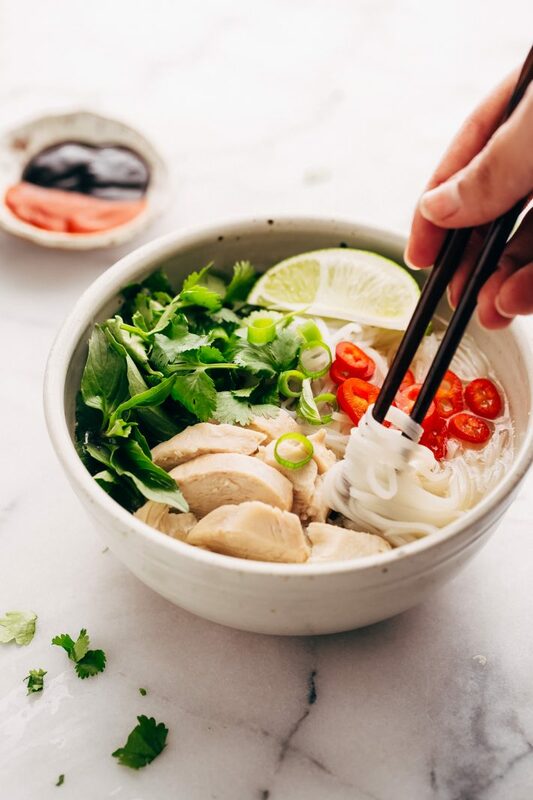 Homemade chicken pho made in the instant pot, in just over an hour! And would you look at that ultra clear broth?! I hear you can tell if you made your chicken pho right if the soup is crystal clear. By far the best thing we had when we were both down with the flu. Let me start by saying that I claim 0% authenticity here. 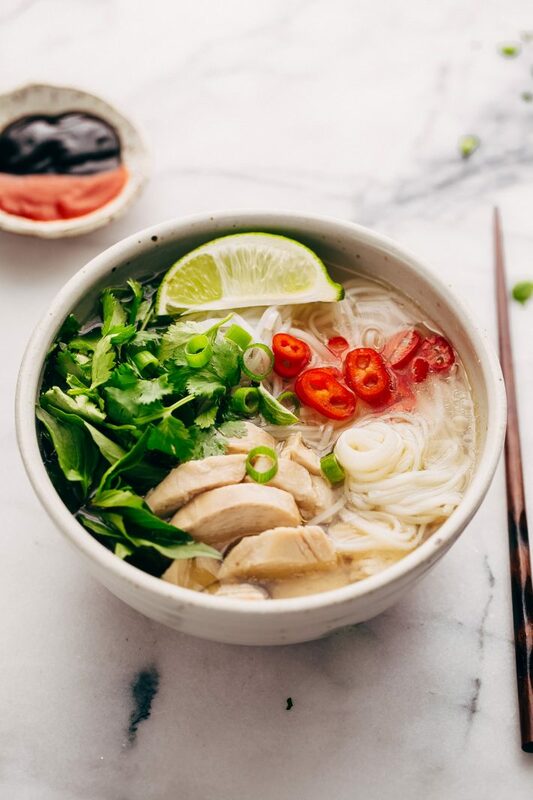 Basically, my instant pot chicken pho came together by doing loads of food tasting, frantic internet searching for the best chicken pho ever, and trial and error. I’ve tested this recipe both on the stove-top and the pressure cooker to see if there was a huge difference in slow-simmering your chicken pho for hours on end or if we could get close enough by tossing it all in the instant pot and letting it go until the chicken was fall-apart tender and the broth was infused with all those aromatics. To tell you the truth, we both preferred the instant pot chicken pho over the stove tops slow-cooked version. Believe me, I was shocked! 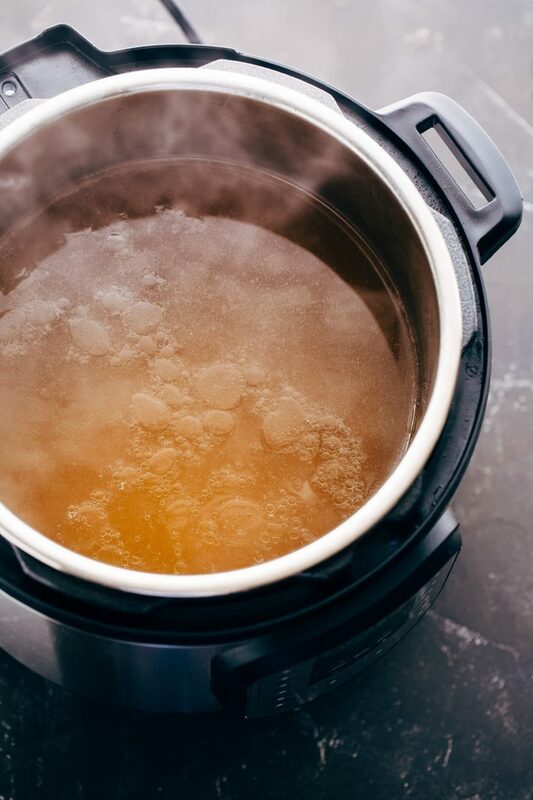 I figured slow cooking the broth, skimming the scum, and letting it simmer gently rather than the chaos in a pressure cooker would undoubtedly yield something far more superior. Imagine my surprise! I went in for a slurp, and the instant pot version transported me to a new level of pho magic. In 25 minutes of pressure cooking, the broth had all the aromas of the spices we used. The chicken was fully cooked. And after a quick strain, the broth was crystal clear. Is this how every Vietnamese mother/grandmother makes her pho? Probably not. Is chicken pho made in the pressure cooker something she’d cringe at? Maybe so. But you know what, it’s an EASY, FLAVOR BOMB of a recipe that takes no time to make compared to the “real” version and I say that alone makes it worth a try! Let’s talk about some of the spices you’ll need for this recipe. I was able to find everything I needed right in my mainstream grocery store without a hitch so you shouldn’t run into any issues there. But I’ll also put links to products here just in case. 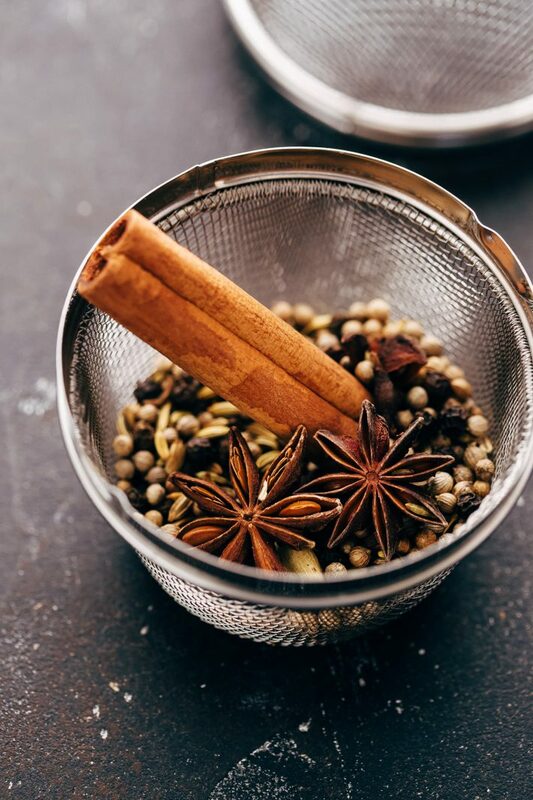 We’ll need whole star anise  (affiliate link), a cinnamon stick  (affiliate link), cloves  (affiliate link), coriander seeds  (affiliate link), green cardamom  (affiliate link), fennel seeds  (affiliate link), and black peppercorn  (affiliate link). I suggest popping them all into a mesh spice basket  (affiliate link) once we’ve toasted the spices so that you don’t have to worry about fishing them out. I simply love my mesh ball and use it everytime I’m making homemade broth or large batches of tea! 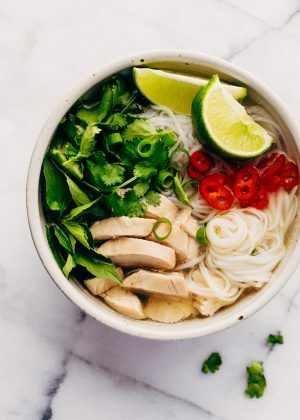 Instant Pot Chicken Pho or any pho starts with toasting the spices. Not all recipes require you to do so. But my mom has always taught me that to unleash the full potential of spices, you drop it in a skillet and let it heat through. This allows the natural oils to warm up and really release more flavor into whatever it is you’re making. You don’t need oil or water for this step. And if you’ve got an instant pot that allows you to saute, you can do this right in the pressure cooker! Once the spices are heated, place them in the mesh ball, and we’ll move on to toasting the onions and ginger. Again, you don’t need oil for this step. We’ll use two smallish onions and a 4-inch piece of ginger. Remove the skin from both and pop them into the instant pot and just let them sear. While researching, I came across a ton of recipes that say to char the aromatics on an open flame. That’s not something I’m willing to do, EVER. Mainly because every recipe warned what a hot mess it makes. #nothankyou. So just give them a flip now and then and once they’ve brown on all sides, we’ll start putting the chicken pho together. We’ll add all the remaining ingredients into the pressure cooker and use a wooden spoon to scratch and loosen all that onion/ginger flavor bits that developed during the searing process. And finally, cover it up and let it all cook on high pressure for 25 minutes. About the chicken: you can use bone-in, skin-on chicken breasts, chicken thighs, or even a whole chicken for this recipe. If you decide to use an entire chicken, I suggest trimming all the excess fat around the chicken but still leaving the skin intact. If you don’t do this step, your chicken pho broth will be extremely oily! Once you release the pressure, pop the chicken into a cold water bath. This will immediately stop cooking the chicken and will allow it to cool down quickly so you can shred or slice it. When the chicken is out, I suggest using a skimmer to grab and remove any scum that may have surfaced, then, just pour the broth through a strainer to get out all the onions and ginger. I like to rinse out my instant pot insert before pouring the clear broth back in. Then, taste and if you want it to have a stronger flavor, just let it simmer on the saute setting for a bit longer to concentrate the broth a little more. Use this time to prepare all your condiments and boil the noodles. 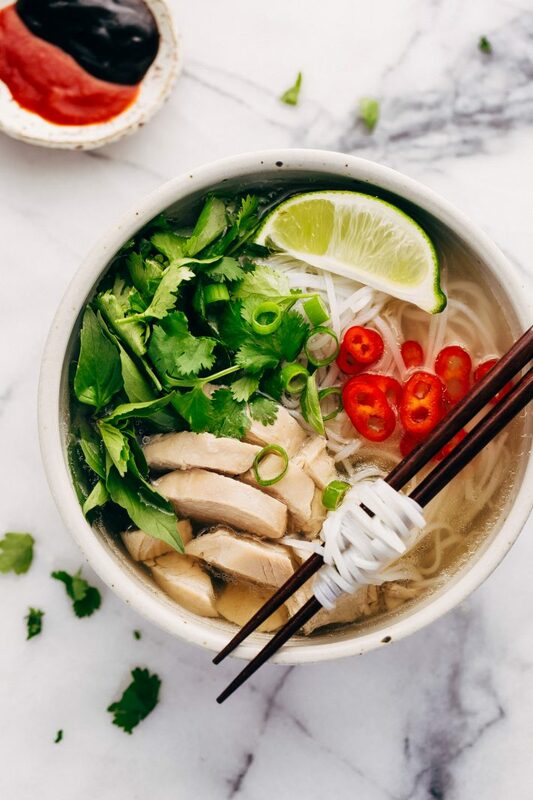 And basically what this instant pot chicken pho does is give you a warm and cozy bowl of aromatic chicken soup loaded with herbs, lime juice, jalapenos if you’re into that sort of thing and perfectly tender chicken. So good you’ll wanna put this on the regular dinner rotation. Toast: Heat the instant pot on the saute setting. When hot, drop the spices listed under ‘spice ball’ into the pot, stirring often, allow them to toast for 2-3 minutes or until fragrant. Place the ingredients into a spice ball  (affiliate link) so that it’s easy to remove later. Add the halved onions and ginger root to the pressure cooker and allow them to sear for 6-8 minutes. You want to flip them once or twice about halfway through. chicken pho: Pour in 9 1/2 cups of water. Using a wooden spoon, scratch the bottom of the pot to help loosen up all the brown bits left behind. Add chicken, spice ball, fish sauce, 1 tablespoon of sugar, and salt. Cover the instant pot; seal the vent. Cook on manual high pressure for 25 minutes and do a quick release. When the instant pot says there are 2 minutes of cooking time left, prepare an ice water bath (lots of ice in a large bowl with cold water.) Remove the chicken to the ice water bath. Skim any scum from the surface of the broth. Strain the broth into a large pot or measuring cup. Rinse out the instant pot insert, then pour the broth back in. Allow the broth to simmer on the saute setting if you want to concentrate the flavor a little more. Taste and adjust with additional sugar or salt to taste. Remove the skin from the chicken and shred or slice the chicken while the broth is simmering. assemble: when ready to serve, place about 2-3 ounces of noodles in a bowl, top with chicken and ladle on the broth. Serve the herbs and sauce on a plate and allow everyone to top their bowl as desired! For the chicken, you can use bone-in, skin-on chicken breasts, thighs or wings. You can also use a whole chicken. If you decide to go the whole chicken route, trim all the excess fat to prevent your pho broth from being too oily! If you don’t like the idea of cooking the raw chicken in the instant pot without skimming, you can also use a rotisserie chicken. Pull off all the meat, add the chicken carcass to make the broth. Serve the pho with the previously shredded chicken!